Apple Inc is regarded as the best company for its cutting-edge supply chain practices. What's the secret behind the Apple supply chain? This article will explain to you what we can learn from the co-founder of the company. It goes without saying that Apple Inc is famous for its strengths in the product design, product development, branding, and marketing strategy. When it comes to supply chain management practices, many people believe that its supply chain model and sophisticated software system are the secret weapons that help them maintain market leadership. The philosophy of product development at Apple is to build "insanely great" products that customer wants to buy. Simply put, Jobs pursued the differentiation or value creation strategy. And when the whole supply chain takes actions in sync with this strategy, the success is phenomenal! From 1983 to 1993 when Jobs didn't take the helm of the company, the cost reduction/profit maximization strategy was the primary strategy which resulted in the downward spiral. When Jobs decided that he wanted the face of iPhone to be the scratchproof glass, he turned to Corning who developed the technology called "Gorilla Glass" but it's just a prototype in the R&D lab. Jobs indicated clearly that he wanted a major shipment of Gorilla Glass within 6 six weeks which was beyond the capability of Corning. However, Job insisted on this request and later Corning converted one of its LCD production lines to produce the new kind of glass. After Jobs returned to Apple in 1997, there was a wide array of unrelated product lines. Then, he announced that he needed only 4 product categories, namely, "Consumer", "Pro", "Desktop" and "Portable". By segmenting the products properly, Jobs reduced the complexity of supply chain big time and his team can prioritize the actions required to support the strategy. Jobs ensured that the performance of microprocessor down to the experience of buying products at its stores was linked together. To do this, Apple increased the internal integration by establishing a common goal across business units. It said on Apple's first marketing brochure that "Simplicity is the Ultimate Sophistication". In literal meaning, Jobs eliminated the unnecessary components which led to the reduction of inventory and a smoother production process. The integration of iPod, Itunes and Itunes Store revolutionized the music industry. However, Jobs was afraid that someone would add a music player on the phone's handset, then, he decided to discontinue the sales of iPod and created the iPhone. Radical change or "Reengineering" may be necessary if the external forces are strong. Jobs believed the great ideas couldn't be developed solely via e-mail. From his experience, he created the ideas from long meetings or even when you ran into someone. This lesson works well for both internal and external relations. Supply chain management is everywhere, from the strategy formulation, product segmentation, product/process design down to customer satisfaction. Supply chain professionals adopt whatever concepts that help to create value. Even though Apple Supply Chain has some "hiccups" such as various problems of suppliers in Asia, they are definitely one of the role models in supply chain management. - Isaacson, W. (2012). 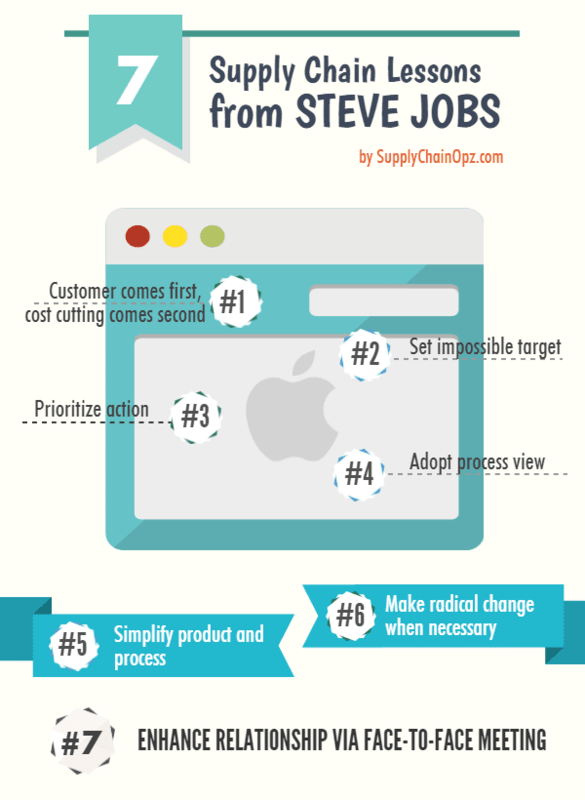 The real leadership lessons of Steve Jobs. Harvard business review, 90(4), 92-102. - Isaacson, W. (2011). Steve Jobs. Simon & Schuster.